Jones' mystery player. Riccardo Scimeca? The 30 year old can play midfield or right back and if he were to come would enforce Sam's claim that WBA are our feeder club. So far we've seen Inamoto, Purse and Koumas heading to South Wales from the Midlands. Scimeca has only featured four times for the Baggie's this season. Last year he was involved in 33 Premiership games. He has spent all his career in the Midlands. He started as a trainee at Aston Villa in 1993 before a £3m move to Nottingham Forest in 1999. 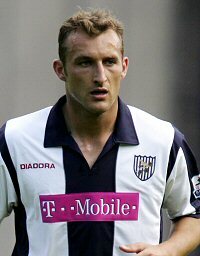 After that he went to Leicester City before joining WBA in 2004. The report in the Echo today claims that talks are at an advanced stage and the player could be here within days.